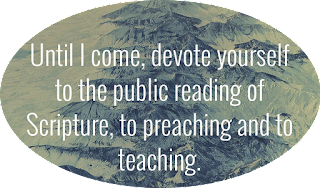 I have over the years gotten much inspiration and a lot of devotional mileage out of the Pilgrim’s Progress by John Bunyan. Back at the first of the year (2009), I was rummaging around through the massive amounts of cassette tapes of sermons that I have and ran across a sermon preached by Pastor John Harrell in Bridge City, Texas. Sometime in the late ‘80’s or early ‘90’s he preached a two-part sermon series on Vanity Fair and although I only had the second part, it proved to be much for mental and spiritual rumination for me over the last eight months. In fact much of my encouragement to dig into Pilgrim’s Progress from a devotional standpoint came from my friendship with Brother Harrell. He is a masterful preacher that week –in and week-out does much from the pulpit in Bridge City. 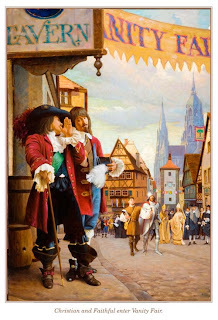 From that old classic Pilgrim’s Progress by John Bunyan there is a scene that serves well as a leaping off point for this blog. Christian and Faithful are on their way to the Celestial City and having come out of the wilderness find a city set up directly beside the road they are traveling. Bunyan is playing off of the pattern of the Lord coming out of the wilderness and then having to face the temptation of the devil. Christian and Faithful (and you and I) are no different in that we will have to face temptations along the way in our spiritual walk with the Lord. Vanity is the city and Vanity Fair is the place of commerce in this vile place. It is created by the construction of the devil as he attempts to get every saint along the way to trade spiritual things for the superficial. Vanity has been around for a long time in fact its origin is from Babylon. It is populated with cheats, fools, knaves, rogues, and apes that spend their time fooling about with games, thieving, murders, adulteries, and false swearers. These types are the salesmen of the things that are being sold. In reality the merchandise there is nothing more than idols of distraction for the travelers. It is a carnival that lasts year round and its devious salesmen are masters at their trade. According to Bunyan, they are selling merchandise to entrap even the heartiest of souls. The wares they offer are houses, land, trades, honors, titles, countries, kingdoms, lusts, pleasures, and sinful delights of all kinds. In addition to that other things for sale are husbands, wives, children, masters, servants, blood, bodies, souls, silver, gold, pearls, and even a mix of precious stones. There is something for every man because the trade of Vanity Fair is a serious affair. In fact it is as serious as heaven and hell and the currency of trade there is not money but rather the souls of men. The whole goal of Vanity Fair is to get men to turn away from the path of salvation and throw away their hope. Immediately striking about this place is the voices that call out and attempt to get Christian and Faithful to turn from the path and sell out their soul. However, it was not very long before the hawkers of Vanity Fair realized that these two men were not going to be dissuaded. “Sir’s, if you aren’t interested in buying what we have, what do you want to buy?” Christian speaks quickly and surely, “We buy Truth.” That is the only real commodity in the realm of the Kingdom of God. When the citizens of Vanity heard this they immediately began to persecute them for three reasons. First, for the way they dressed. They were dressed simply and modestly compared to the citizens of Vanity who were dressed provocatively and immodestly. In fact their clothing was in such contrast that the citizens of Vanity called them fools. Secondly they were persecuted for the way they talked. Their speech was clean and godly compared to the coarse, vile words that poured out of the heart of Vanity’s barbarians. Thirdly, Christian and Faithful did not even want to look at the merchandise that was for sale in Vanity. There is much more to the scene at Vanity Fair but I will let you read the outcome and find out some of the unsavory characters there. Men like Judge Lord Hategood, Lord Carnal Delight, Mr. Blindman, Mr. Live-Loose, and many others. It’s worth your time! This blog will be continued in several parts. I have just read an article from one of the “wizards” of blogdom and have discovered several things about my blog. . . My posts are too long. . . My content is too deep. . . My posts are not consistent (I agree). . . and a few other things that caught my attention. . . So I am going to shorten it, shallow it, and shore it up. . . and do a few other things. . . When Bathrooms Are No Longer the Priority. . .
Then we got in the car and went to the Parade of Homes! I have found that doing such things as this creates for a mostly blissful state of marriage. Little did I know what was in store for me on that day several weeks ago. I have not gone to the Parade of Homes in over ten years because. . . well, just because. 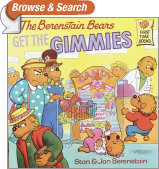 One of the reasons that I don’t go is because it has a tendency to skew my priorities and it gives me the “Greedy Galloping Gimme’s.” This is one of the good lessons the Berenstain Bears taught me years ago when I was reading to my kids. 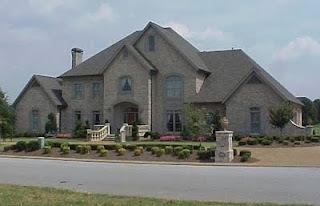 The Parade of Homes, in times past, has created an uncomfortable discontentment with where I currently live which is not a good thing (not that there is anything wrong with where I currently live). Furthermore it has encouraged a ‘keeping up with the Jones’ mentality, which is not good either. For the uninitiated, the Parade of Homes is when the Dothan area homebuilders leave about 200 home newly built homes open for two consecutive weekends so they can be viewed by potential buyers. They are usually in top-notch neighborhoods and are tricked out with all the modern conveniences that incite an insatiable sense of materialism in most of the folks who walk through them. When you add to it immaculate lawns and manicured flower beds, it can get the best of even the most sensible buyers. Toward the end of the day, a creeping madness had started raging in my heart. I knew that I was half-mad when at the next the last stop, I screeched up to the curb, slammed the brakes and with the car half-stopped and Teresa attempting to get over the whiplash from the sudden stop, I leaped out and cleared the manicured lawn in a full scale sprint. Flying up the steps, hustling across the long porch, and muttering under my breath, “Jet Jaccuzzi! Delta faucet!” I was in a nearly catatonic state. Teresa told me later that she was a little concerned about the glazed look I had in my eyes. I informed her that she should not worry about it because it was a near morbid state of materialism-itis. This is generally an inflammation of a greedy heart that usually passes with strong doses of Scripture, a reorientation of priorities, and hanging out with missionaries. I was almost at a point of critical mass when two missionaries dragged me back from the abyss. It was fortuitous that on that weekend that our church had been blessed with two missionary families. The Mike Patterson family (Romania, Muldova, & my brother-in-law) and the Robert Rodenbush family (Regional Field Supervisor-Eastern Europe) had come to the wedding of my niece. So for two hours after my near fatal onset of madness, I had the Patterson’s and Rodenbush’s unfiltered. I am unsure of how we got around to the point of the conversation now, but eventually Sister Rodenbush began to tell us of standing in a bread line in with a missionary in that area of the world. She also shared that the apartment of these missionaries somewhere between 600-800 square feet. They chose one of the smallest they could find because they wanted to be frugal and spend their money in other areas to further the Gospel. When she said 600-800 square feet, I was smitten in my heart because just earlier in the day, I had stood in bathrooms that were at least 200 square feet, maybe more and I had wanted it! I had been almost willing to sell my birthright for a mess of pottage! Her story continued and I was told of a kitchen sink that had those outside variety spigots like you find in our gardens here. The kitchen sink was mounted on a 2X4 frame that was without cabinet doors and only had cloth coverings. My brother-in-law told me later that this missionary had worked diligently and faithfully and over the years (more than 30) had seen three of the churches he served totally collapse and he had to start over from scratch. I had the occasion to spend two hours or so with this man and his wife about two years ago at a conference in Bucharest, Romania. Even before knowing of their sacrifice I felt an incredible spirit in them. It is of such a nature that it almost reaches out and grabs you (in a good way). Last night when I got in late from church, I asked Teresa, “Where is our money going?” When she told me, my conscience was at rest because bathrooms are no longer the priority. . . The Gospel is! To accent this blog, I encourage you to watch the following video. . . and then do something!